One of my fondest memories of childhood is getting to stay at home from school with a cold and enjoying as many bowls of hot chicken soup as my mother could pour down my throat. I mean, while I did not enjoy the cold, I did enjoy getting to stay home from school, being able to hang out with my mom on the couch and watch “the stories” as well as the comfort of the hot chicken soup. I am betting you may have some similar fond memories. I can still feel the soothing warmth of that broth slowly and easily sliding down my raw, scratchy throat. That broth was mildly salty and chock full of garlic and pepper with just a hint of butter. Soft chunks of celery, chicken, carrots, and onions added that little bit of extra that made it complete. And oh what a treat it was if there happened to be some egg noodles added into the mix. Ohh, I can almost taste it now. Many of us grew up with chicken or some other type of soup as a remedy for the common cold and the flu symptoms. If you happen to be a member of Generation X, it is entirely possible that the only other medicine you got was a dollop of Vick’s Salve smeared on your chest, back and under your upper lip. Well, maybe some cold orange juice or some hot lemon water with honey would go along with it as well. Ahh, those were the days. Simple times and simple remedies that worked like a charm, or at least a lot quicker than I wanted back then. I mean come on, I would be hoping for at least a minimum of 3 or 4 days off of school for a cold, but when I dosed with Vick’s and Chicken Soup, the most I ever got was two days. Seriously, two days! My mother and Grandmother swore up and down that homemade Chicken Soup cured me every time. Of course, I believed them, because well….only two frickin days off of school. Unfortunately, as we age, the symptoms seem to affect us a bit more, and we have a difficulty letting go of a cold as quickly as we were able as children. We are miserable when we have a cold and most of us stress about the time we are away from our jobs. Well, guess what? 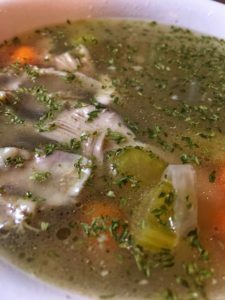 The good news is that even in this day and age of wonder drugs, researchers have found that Chicken Soup really can help alleviate the symptoms of the common cold and flu or at least reduce the severity and length of the symptoms. The nutrients found in the vegetables and the broth help boost the immune system and reduce inflammation. The constant influx of hot liquid eases congestion as well as soothes the throat from the phlegm going down the back of the throat and hydrate the body, not to mention the comfort factor and nostalgic effect consuming the soup has on us. Researchers also found that many commercial soups also accomplished the same thing in helping to reduce or alleviate the symptoms of colds and the flu and not only Chicken Soup. Tomato Soup is another tasty soup that works well on cold symptoms due to the high concentration of antioxidants and Vitamin C. While I adore tomato soup, it always tended to irritate my throat, and I preferred the chicken soup. Just yesterday my husband texted me from work telling me he had the sniffles and a raw throat. That was my cue to get out the big ole pot and whip up a batch of chicken soup. I have a great recipe that is super easy. You can do it fast and quick, but it a bit high maintenance to get it done, or you can do it the slow way that needs less attention. I am sharing my easy chicken soup recipe along with and some other tips for trying to stay healthy and how to eat and train when you are sick in my newsletter that goes out tomorrow. Make sure you sign up for it HERE.